BIG cat researchers have welcomed the State Government's confirmation of a probe into sightings of the elusive creatures in the Otways. State Agriculture Minister Peter Walsh has confirmed the Government's pre-election pledge for an investigation, saying there had been numerous unconfirmed sightings over the past decade. Nationals Leader Peter Ryan made the big cats an election issue, promising to resolve the issue one way or another after continued reports of sightings. 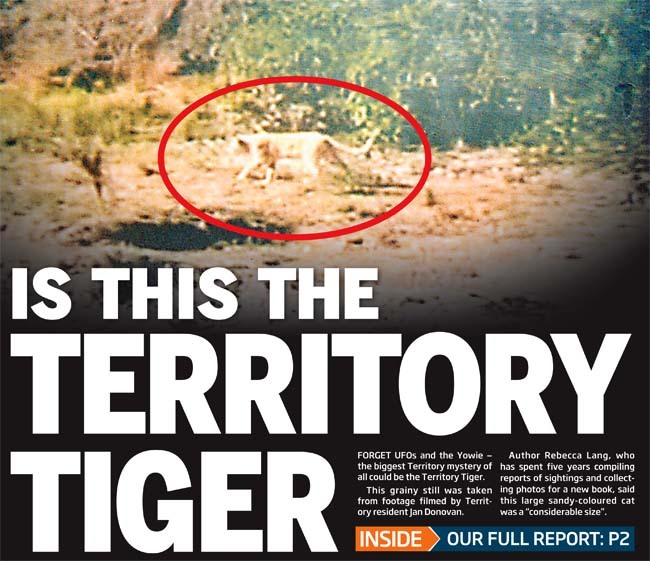 The previous Labor Government refused such a probe, and Labor's environment minister Gavin Jennings said instead of searching for "non-existent big cats," the Nationals "should be out there searching for some real policies that protect the environment". Mr Walsh said the State Government had committed to a "limited investigation" to determine once and for all whether there was any truth behind the sightings. Local big cat researcher Simon Townsend (pictured above), who has been investigating sightings in the eastern Otways for more than a decade, welcomed the probe, saying both he and colleague John Turner would be happy to help with any investigation. Mr Townsend has visited dozens of Otways property owners who've described sightings and shown him photos of slain livestock that he said appeared to have been slain by large unidentified predators. "We take this issue quite seriously," he said. "We're not saying the animals are there, we're saying there's circumstances that suggest they are, and there's an awful lot of eye witnesses who need to be respected. "If the Government's being proactive, they really need to be asking and involving people with some involvement in the issue." 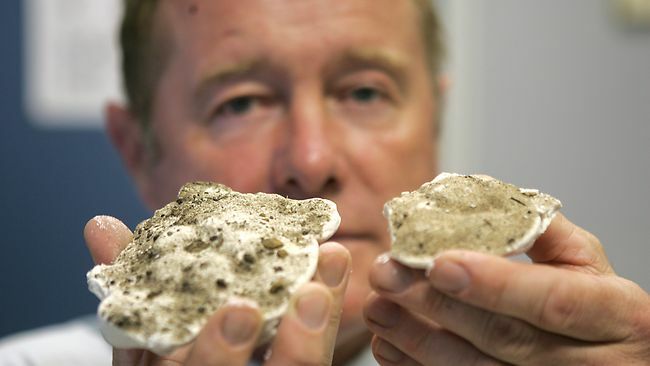 Geelong Advertiser nature writer Trevor Pescott yesterday cast doubt on the probe. "You can't prove that something doesn't exist, and that's what will come out of this," he said. Mr Pescott said people had told him about big cat sightings, but he had never seen anything himself and while there were still continuing reports, no solid evidence had been produced. "I'm still a bit dubious, although I'm not a person to say yes or no because sometimes unusual things turn up," he said. Last month, an Anglesea woman Melva Stott wrote of seeing what she thought was a puma, but the animal appeared to be a black wallaby. However Ms Stott said she had seen two pumas in different locations around Anglesea. Yes, it's not far off - one of the UK's top Fortean events of the year - the CFZ's Weird Weekend! More speakers will be announced in the next few weeks. However, we can announce that once again the children's area is being run by Clan Curtis from Seaham-on-Sea, and the animal handling will once again feature Bugfest from Yeovil (highly recommended for anyone who has ever felt the yen to stroke a tarantula!). Advance tickets are only a recession-busting £20 a pop, so buy yours now! 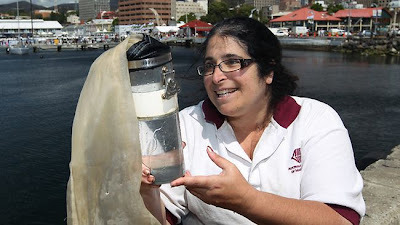 "A NUMBER – for instance all samples collected on day one are numbered 101, 102, 103 and so forth. On day two, the numbers are 201, 202, 203 and so on." Read more at CFZ UK. FEISTY macropods forced organisers to abandon the annual Hanging Rock Australia Day races in Victoria after a mob of kangaroos repeatedly invaded the track.The Hanging Rock Racing Club holds only two race meetings a year - on New Year's Day and Australia Day - in a tradition going back more than 125 years. The race track is at the foot of the famous Hanging Rock formation in the Macedon Ranges. The area is famous as the setting of Picnic At Hanging Rock, a novel and subsequent film about the mysterious disappearance of three schoolgirls and a teacher on an outing at Hanging Rock on Valentine's Day 1900. By sleuthing through genes found in feline pelts more than a century old, scientists have discovered that the newest species of big cat known to science, the mysterious Sunda clouded leopard, actually comes in two different types. These big cats apparently owe their origins to cataclysmic super-volcano eruptions and rising sea levels, researchers found. 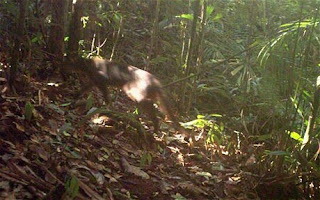 "They're sometimes even called modern-day saber-toothed cats," researcher Andreas Wilting, a wildlife biologist at the Leibniz Institute for Zoo and Wildlife Research in Berlin, told LiveScience from Borneo. Comparisons between the clouded leopards of mainland Asia and the Sunda Islands of Southeast Asia, which include Borneo, Java, Sumatra and Bali, revealed the Sunda clouded leopard was genetically distinct, making it the newest species of big cat known to science. "The canines on the Sunda clouded leopard are even longer than seen on the mainland clouded leopard, and they have more dots in their cloud-shaped markings than mainland ones," Wilting said. "They are as genetically distinct from mainland clouded leopards as leopards are distinct from lions." 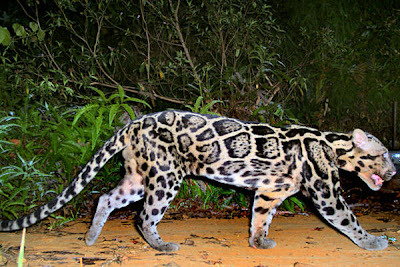 Although scientists wanted to learn more about the Sunda clouded leopard (Neofelis diardi), "they are hard to find in the forest," Wilting said. 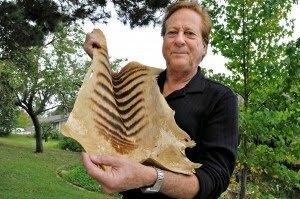 As such, he and his colleagues investigated DNA they gleaned from clouded leopard pelts, skulls, claws and bones gathered on the islands and kept in museums worldwide for up to more than a century, as well as excrement collected more recently by researchers in the field. "Working with ancient DNA from museum specimens that were often highly degraded was a major challenge," Wilting said. The scientists' genetic analysis — combined with investigation of available bones — revealed the Sunda clouded leopard is actually divided into two subspecies — Neofelis diardi diardi, indigenous to Sumatra, and Neofelis diardi borneensis, exclusive to Borneo. "Although we suspected that Sunda clouded leopards on Borneo and Sumatra have likely been geographically separated since the last ice age, it was not known whether this long isolation had caused them to split up into separate subspecies," Wilting said. There were considerable genetic differences between the groups. There were also physical distinctions, often subtle in nature. 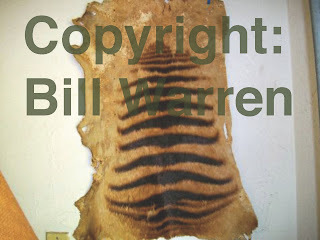 A comparison of coat color patterns conducted by researcher Andrew Kitchener from National Museums Scotland saw only small deviations between the groups, which could be due to how the highly similar tropical habitats on the islands demanded similar camouflage strategies. The skulls also showed minor variations, according to researcher Per Christiansen of the University of Aalborg in Denmark — for instance, the Sumatra cat has a slightly wider nasal aperture relative to muzzle width than the Borneo one. Both subspecies of Sunda clouded leopard are classified as endangered, since their numbers are low just like all other big cats. In order to save the Sunda clouded leopard, it is paramount to protect large areas of forest in Borneo and Sumatra or at least to manage them sustainably, Wilting said. The researchers are working closely with wildlife officials in the Malaysian state of Sabah in Borneo to investigate and conserve the cats. 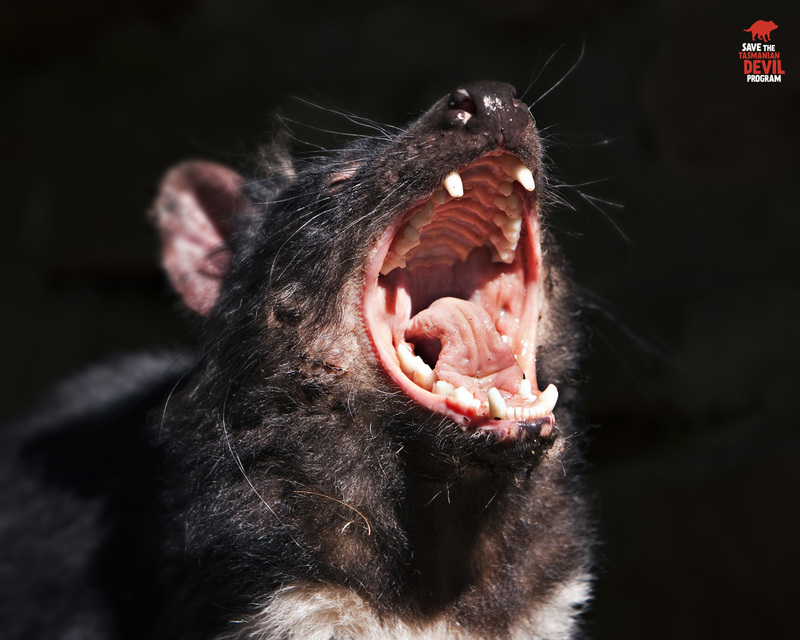 Ten female and five male Tasmanian devils have been transported to New South Wales as part of the latest addition to the Save the Tasmanian Devil Program's Insurance Population. 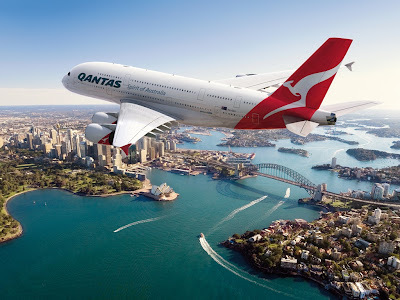 The devils were transported from Sydney airport to a new facility at Barrington Tops north of Newcastle. The Barrington Tops facility, developed by the Australian Reptile Park, includes large free range enclosures where the devils will be able to roam in a 'Tasmania-like' landscape. They will be joined by another 15-20 devils from the Australian Reptile Park at Gosford. The Save the Tasmanian Devil Program recently awarded a grant of $350,000 to the Australian Reptile Park to support the development of the facility. 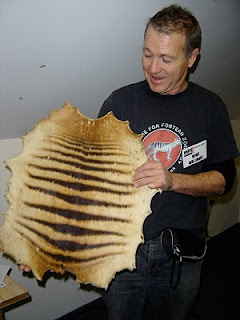 While the Tasmanian tiger is gone forever everyone can do their bit to help out other threatened species. Waterfall Springs Wildlife Sanctuary and Foundation has been working hard to help out the endangered brush-tailed rock wallaby. The Waterfall Springs breeding program is about building a healthy captive population of animals for release back into safe wild habitats. 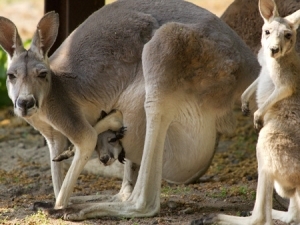 It is a major part of the Australian Government’s national brush-tailed rock-wallaby recovery plan to ensure the long-term survival of the species, listed as the sixth most threatened macropod in Australia. 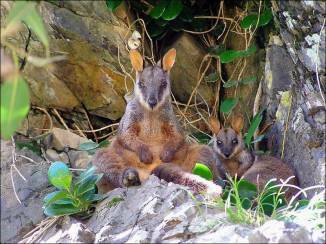 The sanctuary successfully released captive wallabies into the wild in April and plans another release later this month. There have also been 12 new animal enclosures and an education facility built at the sanctuary. One way the public can help threatened species is to join its new volunteer group the Friends Of Waterfall Springs. The group’s program aims is to provide volunteer support to the sanctuary so it can continue to support brush-tailed rock-wallaby conservation through the endangered species captive breeding program. One Brisbane family was shocked to return to their flood-damaged home and find their backyard had been cleaned up by a turkey. 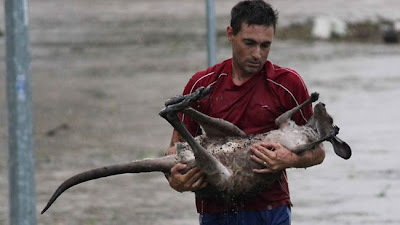 The Rudolph family, of Chelmer, was forced to abandon their flooded property when it was engulfed by one metre of water. 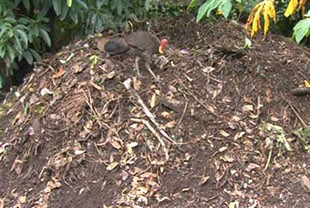 But during their absence a brush turkey set to work clearing up their debris-filled backyard. The turkey, nicknamed Colin, has gathered debris from several backyards to construct a nest, estimated to weigh as much as four tonnes. "He was looking at us like we were the lazy ones," resident Pete Randolph told Nine News. "We were thinking of giving him a bit of extra training and putting him to work in the house." Colin has reportedly cleaned up backyards all the way down the street in his efforts to attract female turkeys - and his tactics appear to be working. "I've seen him wander down the street with a little harem of ladies," Mr Randolph said. Much of Chelmer sits on the banks of Brisbane River and was badly affected during last week's floods. For decades tourists have swamped the picturesque shores of Fraser Island, a holiday mecca and World Heritage-listed site of exceptional beauty and home to a range of native species. But what they see today when they visit might shock them - starving pure-bred dingoes, the victims of a bizarre approach by the Queensland Government to discourage human-animal interaction on the island following the death of a young child who was mauled by dingoes 10 years ago. Wildlife photographer Jennifer Parkhurst paid the price for trying to help the dingoes - a species Australia can't seem to make up its mind about. On the one hand its lauded as a cultural icon and remembered as a companion of the first Australians who set foot on the continent, on the other derided as a pest and threat. But is that any excuse to torture a species? Sydney Morning Herald journalist Frank Robson caught up with Jennifer Parkhurst recently, and what she has to say about the plight of the dingoes is heartbreaking. 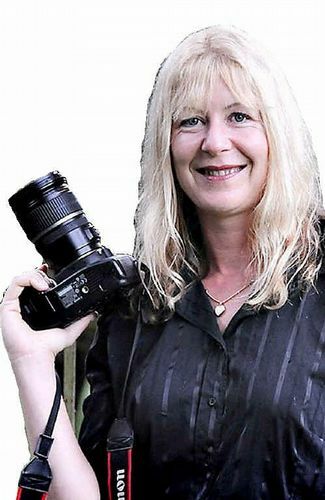 Wildlife photographer Jennifer Parkhurst fell foul of the law trying to protect the island's harried inhabitants, writes Frank Robson. Jennifer Parkhurst's war with the custodians of Fraser Island's dingoes began when she saw rangers setting traps for the harried animals atop a sand dune. It was 2003, two years after a nine-year-old boy had died in a dingo attack, and the traps were part of the Queensland government's radical crackdown on human-dingo interaction within the world-renowned national park. 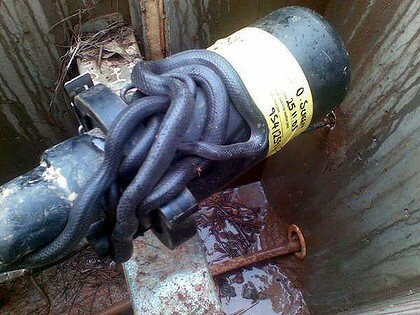 Parkhurst, a wildlife photographer, approached the rangers and asked to see the traps. They were the usual cruel-looking devices, but the rangers assured her that a covering of rubber on the jaws meant the dingoes would not be hurt. Once trapped, they would be ear-tagged for identification and then released. "So I said, 'OK, if they don't hurt, let's pop your arm in one and trigger it,'" Parkhurst says. "But they didn't go for that idea. After that, relations between me and DERM [Queensland's Department of Environment and Resource Management] got steadily worse." 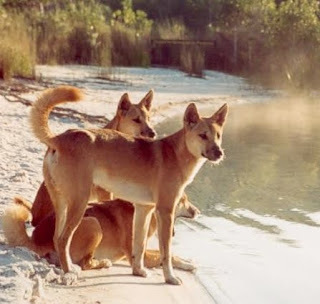 Over ensuing years, rangers killed scores of "problem" dingoes and fenced off the island's residential communities and campsites to isolate the animals from humans. Signs were erected and brochures depicting dingoes as fearsome, toothy killers liable to attack at any moment were distributed, with a warning that anyone feeding them would be ordered off the island and fined up to $3000. Cut off from their human food sources - rubbish tips, camp bins and the island residents who had fed them scraps for decades - and with their natural habitat under siege by up to 350,000 tourists a year, Fraser's native dogs, one of the purest dingo strains left in Australia, became desperate victims of Queensland's bizarre tourism-native species juggling act. 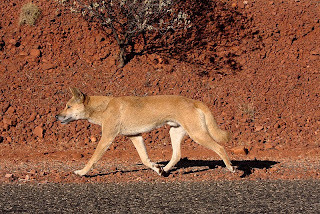 Snapshots by island residents show emaciated dingoes standing plaintively outside the communities' electrified cattle grids or dragging legs injured by the department's "harmless" traps or being "hazed" (shot at by rangers with slingshots and pellets) away from carloads of excitable backpackers. In some cases, autopsies of those killed by rangers revealed nothing in their stomachs but sand or plastic waste or grass. "To see these beautiful animals in that condition broke my heart," Parkhurst says. 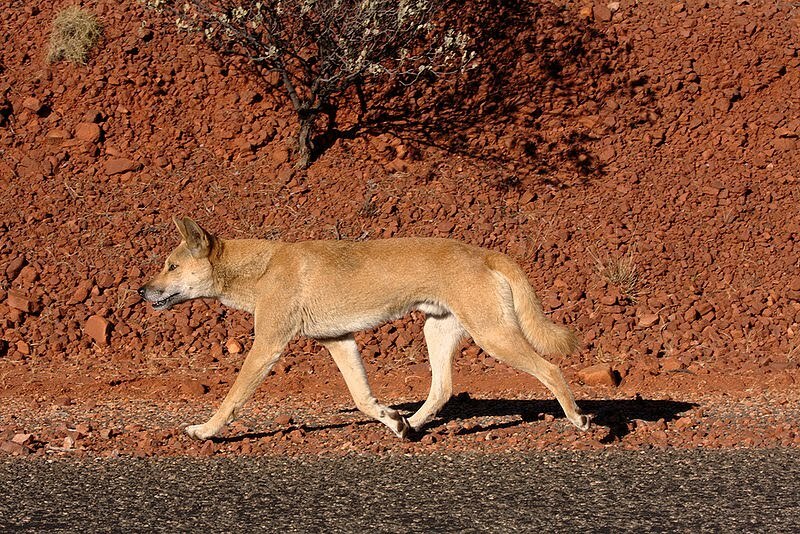 "The Queensland Parks and Wildlife Service [a department agency] estimates there are more than 200 dingoes on the island, but even allowing for seasonal breeding variations I think there are a lot less than that." For years, Parkhurst, 43, travelled daily from her home at Rainbow Beach to photograph one of the island's 10 dingo packs at Hook Point, on Fraser's southern tip. 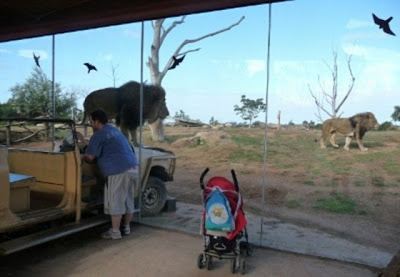 Increasingly at odds with the rangers, who suspected her of illegally feeding the pack, she was woken early on August 25, 2009, by five department officials and a policeman, who had a warrant to search her home. On November 3 last year, Parkhurst appeared in Maryborough Magistrates Court and pleaded guilty to 46 charges related to feeding and "disturbing" dingoes in the Great Sandy National Park (Fraser Island) between July 2008 and August 2009. Pleading not guilty wasn't an option: among the videos seized was footage of her feeding members of the Hook Point dingo pack and celebrating Christmas Day 2008, with the pack and her now former boyfriend. Parkhurst is heard to say: "Three roast chickens … disappeared in seconds, but gee whiz, they loved it." She was fined $40,000 and received a nine-month jail term, suspended for three years. The magistrate, John Smith, referred to the "deliberate nature" of Parkhurst's offending, saying she had engaged in a covert campaign over a long period and had sought to hide her offending from rangers. At her home, Parkhurst told the Herald she had been made a scapegoat for the department's flawed management of Fraser Island. She believes the harshness of her sentence was linked to her role as an activist against the government's treatment of island dingoes. "I have to take responsibility for what I did," she adds, "but I don't accept that feeding starving animals makes them dangerous. 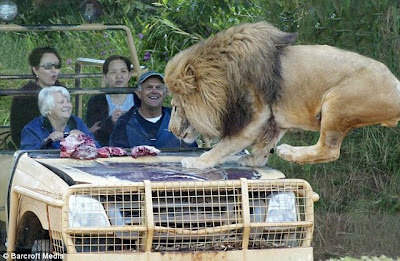 I believe if everyone was feeding them - as residents and rangers used to - they would be less of a risk to visitors, not more." Before her court appearance, rangers killed five of the juvenile dingoes Parkhurst had fed and given names to, claiming they had become habituated and had "attacked" humans. "My actions put the spotlight on that pack, and that's what got them killed. That's what I'm remorseful about … yet I hope people can understand how horrific it was watching those animals starving. It's such a slow, cruel, horrible process." Is it coincidence or something more? 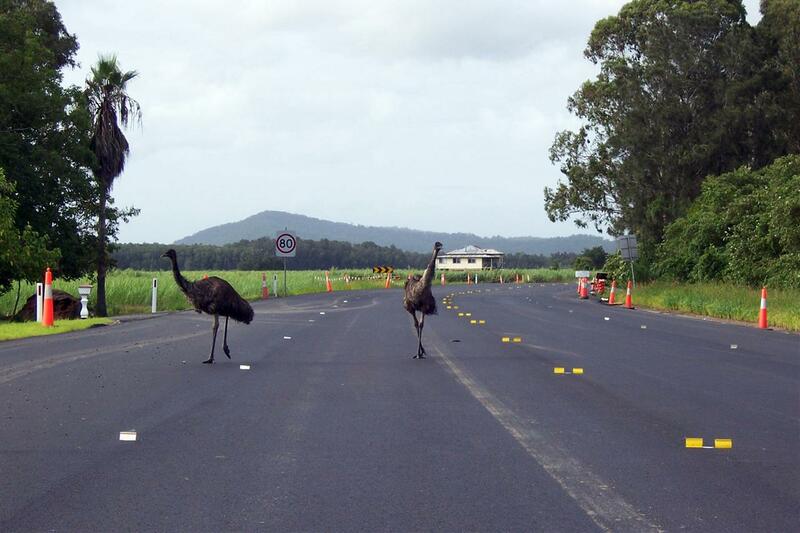 Mass animal deaths have been attracting lots of media attention in the past few weeks, with some wags referring to the massive numbers of dead birds being found as the 'aflockalypse'! Biologists say mass die-offs happen frequently and, for a change, they have bee reported on more frequently over the traditionally quiet December-January news period. What do you think? Check out this just in from Australia. THOUSANDS of dead fish have been found floating on the surface of a small lake inside Sydney Airport. Authorities were still trying to determine the cause of the fish kill in North Pond yesterday. The pond is on the northern boundary of the airport 600 metres from the domestic terminals and close to the area where Qantas maintains and repairs aircraft. The oval-shaped pond, which is about 300 metres long and 150 metres at its widest point, receives water from the Cooks River, via the Alexandra Canal at St Peters. The fish were found on Friday before a clean-up and testing procedures were ordered. 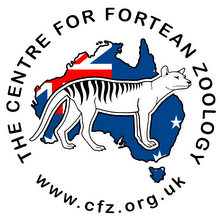 Mass animal deaths all over the globe, including New Zealand, are the focus of this news story, first featured over at the CFZ UK website. So what killed the birds and the fish? 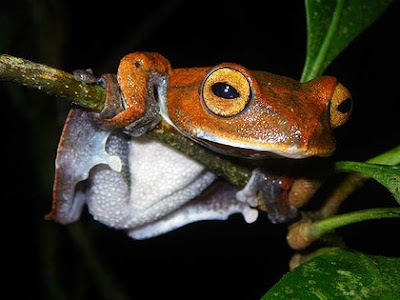 Meet Rhacophorus vampyrus or the Vampire Flying Frog, a strange new species of frog harking from south Vietnam recently discovered by Australian Museum Scientist Jodi Rowley. The new species is only known to inhabit a single, high-elevation patch of montane forest in Southern Vietnam, where it breeds in small, water-filled holes in trees. This unusual frog has adapted for life in the trees, using webbed fingers and toes for jumping from great heights and gliding - hence the ‘flying frog’ name. But it’s the strange black ‘fangs’ the species’ tadpoles display which has earned it a place in the vampire world. In place of a normal set of mouthparts (usually similar to a beak), tadpoles of the Vampire Flying Frog have a pair of hard, black ‘fangs’ protruding from the underside of their mouth. This newly discovered fanged tadpole is giving the Australian Museum research scientist Jodi Rowley and her colleagues plenty to think about. "This is the first time that ‘fangs’ have been recorded in a frog tadpole. 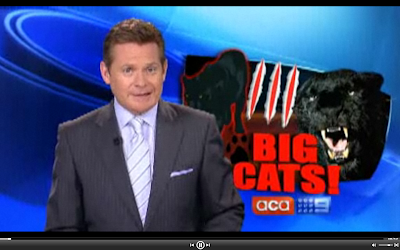 We can only speculate at this stage what the fangs are for and we are now looking in to that,” Jodi said. We whipped out our handy copy of The Field Guide to the Birds of Australia (a must for every self-respecting Australian naturalist's bookshelf) and managed to find our fair-headed friends (pictured below) listed among the pigeon family, Columbidae livia. 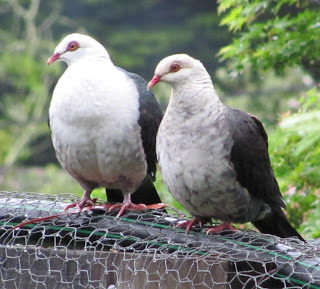 The birds spotted in a suburban backyard a few weeks back were in fact White-Headed Pigeons, which are found all along Australia's east coast from northern Queensland to southern NSW. They frequently travel in pairs and prefer tropical/rainforest areas and in particular loves the Camphor Laurel tree, and feeds on fruit in tree canopies and fallen grain. Keep an ear out for their distinctive cry, which is loud and gruff sounding like "WHOO!" followed by a gruff inhalation sounding "uk" (repeated three times). Sometimes the call is a low "oom". Happy birding! An interview with CFZers Mike Williams and Rebecca Lang about their Australian Big Cats: An Unnatural History of Panthers book aired on Australian telly this week. 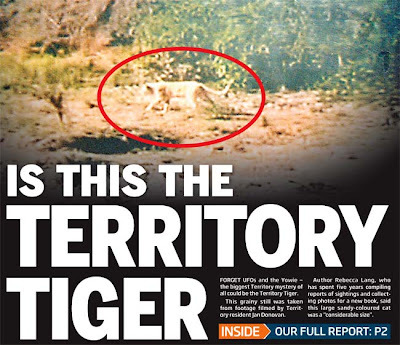 The grainy photo on the front page was thought to be that of the Territory Tiger. It was taken from footage filmed in the 1990s by Territorian Jan Donovan. 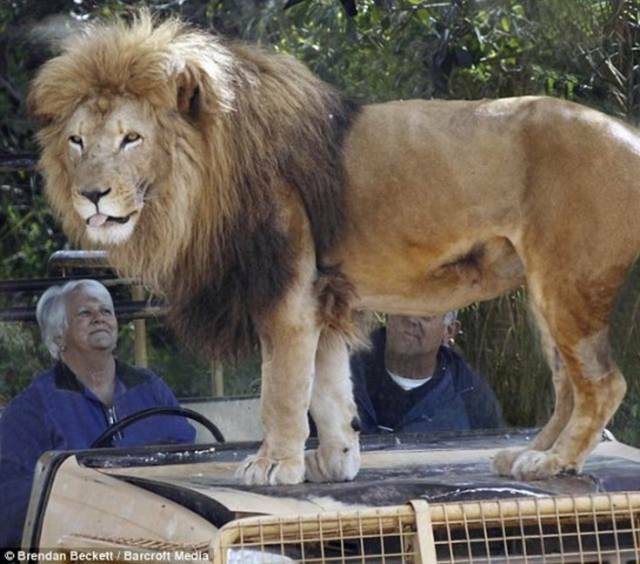 Author Rebecca Lang said the large, sandy cat appeared to be of "considerable size", and could be the descendant of escaped circus cats. 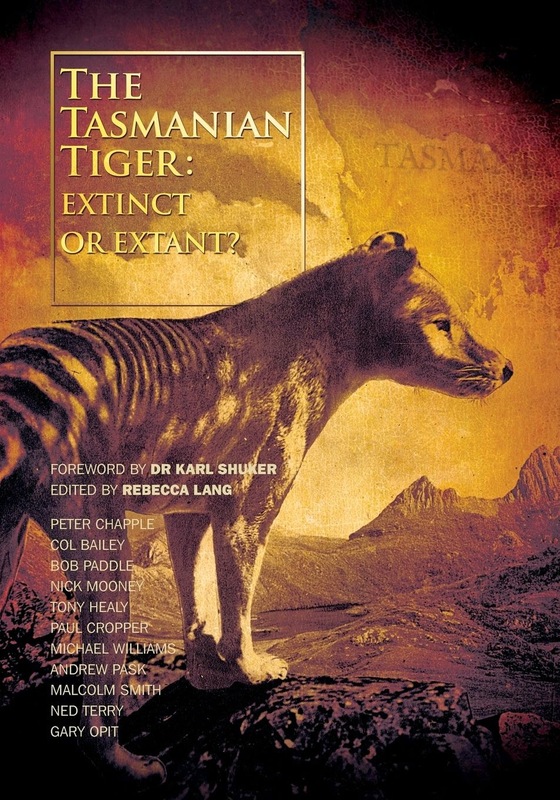 Ms Lang and co-author Mike Williams spent five years compiling their book Australian Big Cats: An Unnatural History of Panthers. 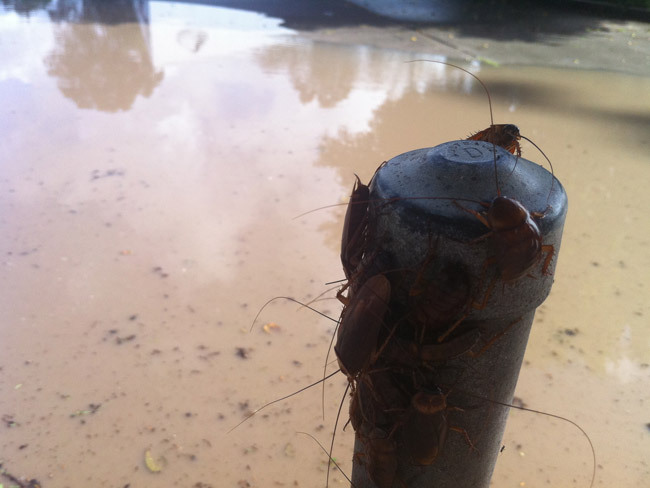 It's no secret that parts of Australia are experiencing dire flooding. Other parts of Australia, particularly along the eastern seaboard, are experiencing lots of rain which, in addition to boosting the population of frogs, mice and other small creatures has seen certain species of birds paying a visit. Who can name this pair? They were spotted in the Blue Mountains far, we suspect, from home. We're thinking some species of native pigeon (male and female? 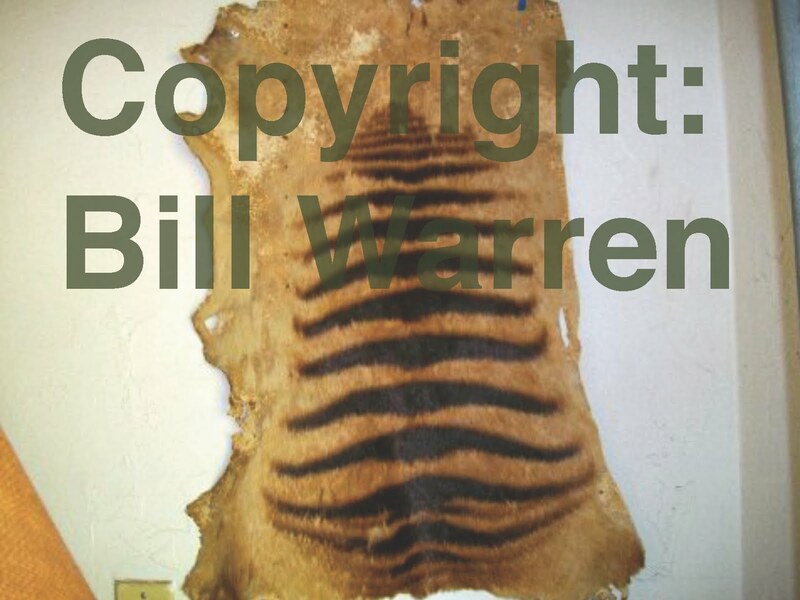 ), possibly harking from a rainforest area? Considerable excitement has been caused in Euroa by reports as to an extra- ordinary animal having been seen in a swamp at Wylonemby, about fourteen miles distant. The swamp is about 150 yards across, and a creek flows through it. For six years or more the swamp is reputed to have been the haunt of something abnormal, tales being told of dogs flying out of the place, and never again being induced to enter. 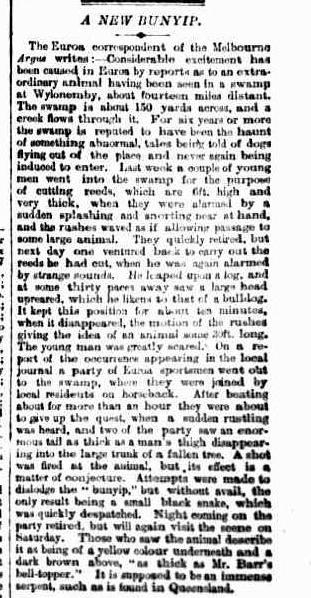 Last week a couple of young men went into the swamp for the purpose of cutting reeds, which are 6ft. high and very thick, when they were alarmed by a sudden splashing and snorting near at hand, and the rushes waved as if allowing passage to some large animal. They quickly retired, but next day one ventured back to carry out the reeds be had cut, when he was again alarmed by strange sounds, he leaped upon a log, and at some thirty paces away saw a large head upreared, which he likens to that of a bulldog. It kept this position for about ten minutes, when it disappeared, the motion of the rushes giving the idea of an animal some 30ft. long. The young man was greatly scared. On a report of the occurrence appearing in the local journal a party of Euroa sportsmen went out to the swamp, where they were joined by local residents on horseback. After beating about for more than an hour they were about to give up the quest, when a sudden rustling was heard, and two of the party saw an enormous tail as thick as a man's thigh disappearing into the large trunk of a fallen tree. A shot was fired at the animal, but, its effect is a matter of conjecture. Attempts were made to dislodge the bunyip, but without avail, the only result being a small black snake, which was quickly despatched. Night coming on the party retired, but will again visit the scene on Saturday. 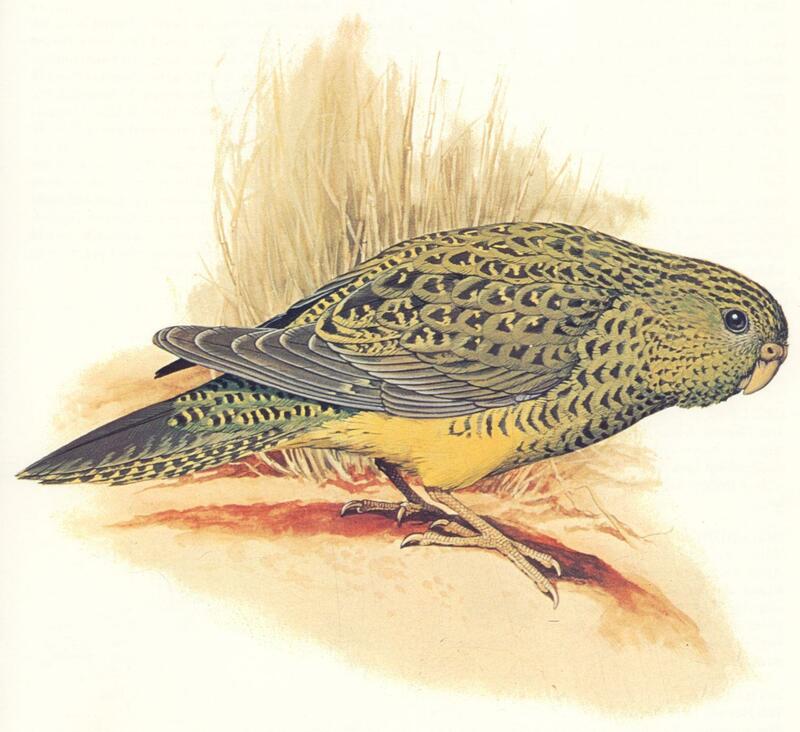 Those who saw the animal describe it as being of a yellow colour underneath and a dark brown above, "as thick as Mr. Barr's bell-topper." It is supposed to be an immense serpent, such as is found in Queensland. Bird lovers everywhere are well aware of the extinction rate among our feathered friends. In the Southern Hemisphere there are plenty of species that have fallen by the wayside. Norfolk and Lord Howe Islands have by far the worst record of bird extinctions in Australia, which continues to this day. 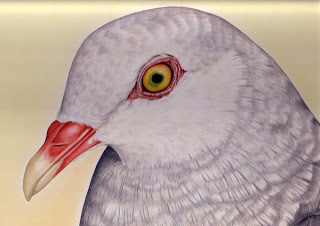 The kaka (a separate species to the NZ parrot) and pigeon (a NZ sub-species) were exterminated by hunting and forest loss, but the latest wave of extinctions has been largely from rats and cats. The last island thrush (guavabird) was seen in the 1970s and the white-chested white-eye (pictured right) is on the verge of extinction. Guy Dutson shares details of his search for the white-chested white-eye with Australian Geographic. 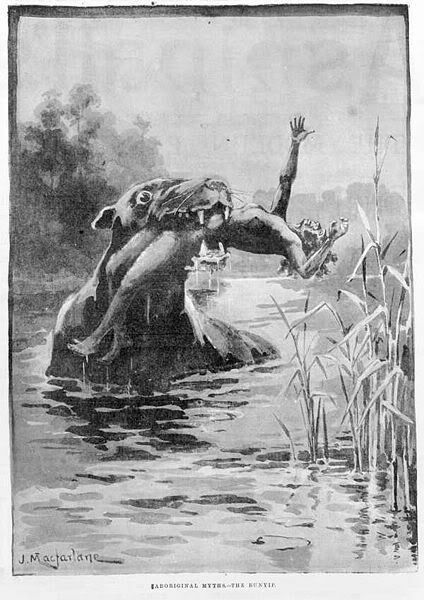 Various sightings of the Bunyip have been recorded as having fur, feathers, fishy scales and or a shiny brown coat. It has a long tail or an elongated neck (depending on which end you thought you saw). Half man, half animal, it is tall with a round head, big eyes, long ears and utters a blood curdling cry when approached. Altogether it sounds like a most alarming animal to encounter!